Pars Orationis by Vicki Wine Bolchazy-Carducci Publishers has reprinted Archibald Maclardy’s Parsed Vergil, Book I, printed in 1899 and 1901. While Latin teachers are familiar with the meaning of the term “parsed,” some may not realize that it comes directly from the Latin pars orationis, to mean literally “part of speech.” Educators today can use this book as a ready reference and perhaps even learn something new from the extensive notes. The author envisioned the book as a resource for both beginning and experienced Latin teachers: both those rusty in Latin who nevertheless find themselves called upon to teach Vergil without much time for preparation; and also those who are ‘up’ in Vergil, but still may benefit greatly, at the first, by having at their elbows a model for teaching and drilling which, like this, sets forth to the most minute detail each step in the parsing and the translation of every word in the text, and indicates to the eye clearly and correctly the scansion of every line The Latin text is presented in divisions of feet, with caesurae and elisions. Below each line of Latin is an interlinear translation, in the order of the Latin words. On the side is a more fluent translation of the two or three lines that are typically handled on each page. Below these lines are thorough notes, with each Latin word completely parsed, and with a commentary referring to grammars as well as explanations of interpretation and meaning. The author describes the footnotes as “both explanatory and critical.” In addition to the parsing of each word and reference to Latin grammars when needed, the notes explain mythological and historical allusions. Notes on critical word study appear as well. 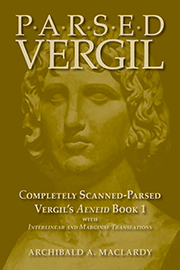 Ward Briggs, Jr., in his preface to this reprint describes this book as “the most thoroughly and reliably parsed text of Vergil in existence.” Having this wealth of information at hand in one volume, conveniently arranged on the same page with the Latin line, provides an efficient way to review passages and to prepare material for class. For example, in line 17, gentibus is parsed as dative plural, and the vocabulary form of the word and its origin from geno, “I beget,” is given; then the note gives its use as “dative of indirect object after regnum esse” and refers to the page numbers in three grammars to explain dative of personal interest, after which the notes continue with an explanation of gens: “here means nation; other meanings are race; offspring, house, made up of families, such as the gens Iulia at Rome.” At the end of the book is the complete scansion of Book I, which, the author reminds us in the preface, also provides opportunity for sight translation. Teachers will find many ways to use this book as both a reference and a resource in introducing their students to Vergilian style and meter, Book 1 of the Aeneid, and Latin grammar. Beginning teachers or those unfamiliar with the Aeneid will find the thorough notes invaluable for understanding the grammar and context and being prepared to answer students’ questions. Those already familiar with the Aeneid will enjoy the convenience of ready reference not only to grammar, but also to explanations of mythological and historical allusions, scansion, and interpretation. Complete text of Aeneid Book 1 with complete parsing of every word and metrical analysis of each line.